Our classes train and certify students in the process of testing for household mold and toxic mold, evaluating mold problems, the damage caused by mold and other air and water quality issues. Our instructors are trained in the latest mold detection, abatement and removal techniques, and present classes designed to fit the industry by being dynamic, informative, and interesting. Dynamic because the indoor air and mold testing and abatement industry is ever-changing with new problems to solve and new solutions to implement. Informative by packing the allotted time for each class with a wealth of the latest information and resources to better inform and educate the student. Interesting because our Trainers use a variety of teaching tools and techniques to vary the instruction using DVDs, High-Speed Internet, Live Streaming Video, and Lectures. When you add to the mix the finest hi-tech Continuing Education in the industry, the NORMI member is assured an education that will keep him current with this ever-changing field. Read some of the testimonials and you'll be more convinced than ever that the Best Training School is truly what it claims to be, "Training for the 21st Century". Signup to our newsletter to stay abreast of the latest classes and offerings. To facilitate your finding the class suitable to your needs, please simply move your cursor over the selected course and click. A drop-down box will appear with a short explanation of the course. A link is then provided to take you to the specific course landing page with details on the course, instructions for pre-requisites and class dates/locations for onsite and online links. This onsite, hands-on course is designed to train the IAQ professional to follow the successful NORMIPro Management model of holistic, solution-based assessments. Attendees are given two days of classroom training which includes the solution-based assessment process, sampling strategies/techniques, laboratory report interpretation, report/protocol writing and IAQ solutions. The CFS has completed a course on formaldehyde, the sources in our indoor environments, its deleterious health affects, screening processes to establish baselines and improvements, and methods by which formaldehyde in indoor environments may be substantially reduced and managed. The first training of its kind is offered to the public and IAQ professionals who are concerned about reducing and managing formaldehyde levels and other VOCs. Professionals are trained in utilizing both formaldehyde and microbe sampling to create healthier environments indoors. This training has been specifically designed to instruct you on the technologies involved in cleaning air indoors. If you sell indoor air quality products and services you need to be trained on assessing indoor environments. This program is designed to train IAQ Professionals in a solution-based assessment process that includes surveying the customer for perceived IAQ problems, evaluating the indoor environment and quantifying those problems, and offering solutions that are wholistic and represent the latest technologies for IAQ management. HVAC Contractors, Home Inspectors, Facility Maintenance Directors, and other IAQ Professionals will be trained in effective ways to solve indoor environmental issues. This course is designed to teach onsite technicians, who perform mold remediation as a result of water damage, about water damage, its effects and techniques for drying of structures. Applies approved, green technology, safe and proven anti-microbials, protectants, encapsulates, biocides, and other chemicals for the prevention and control of surface microbes including mold, bacteria, and algae. The CMA is a fully licensed and insured professional, trained to meet specific state requirements for licensure (where applicable), who has completed at least 60 hours of education in advanced mold assessment techniques including mold, water, and respiratory protection (PPE). Based on a NORMI proctored examination, this experienced professional develops an IAQ profile using investigative techniques and writes protocol for either sanitization or remediation based on IICRC S500, IICRC S520, NYC Guidelines, and EPA Standards. The CMA has also been trained in corrosive drywall (CDW or Chinese Drywall) screening and mitigation, based on the latest information provided by the Consumer Product Safety Commission (CPSC), EPA, and other governmental controlling agencies. Investigates Indoor Air Quality and Mold problems and develops an IAQ Profile for the purpose of offering either Mold Sanitization or Mold Remediation recommendations. The CMR is a fully licensed and insured professional, trained to meet specific state requirements for licensure (where applicable), who has completed at least 30 hours of education in mold remediation techniques including assessment, mold, water, and respiratory protection (PPE). Based on a NORMI proctored examination, this experienced professional develops follows industry standard protocols for either sanitization and remediation based on IICRC S500, IICRC S520, NYS Guidelines, and EPA Standards. The CMR has also been trained in corrosive drywall (CDW or Chinese Drywall) screening and mitigation, based on the latest information provided by the Consumer Product Safety Commission (CPSC), EPA, and other governmental controlling agencies. The CMW (certified mold worker) is trained in the processes leading to and involved in the remediation of mold from indoor environments. Those who work in the mold industry should understand the basic mycology of mold, the seven components of indoor air quality, moisture control, sanitization techniques, remediation guidelines, "generally accepted practices" including personal protection equipment (PPE), hazards communication (HazCom), and OSHA safe workplace practices. The NORMI Certified Protocol Writer (CPW) has been trained as an Assessor and understands the remediation concepts that support the IICRC S5200, IICRC S520, NYC Guildelines, and EPA Standards. Based on the NORMI Proctored Examination, this experienced and well-trained professional develops a protocol that follows industry standards and supports the NORMI Certificate of Sanitization program, assuring the client that the project will be done correctly and according to General Accepted Industry Standards. The CPW develops a Scope of Work that protects the Remediator from down-side litigation and the homeowner from the recurrence of mold infestation. This course is designed to meet the criteria required by the State of Florida Mold-Related Services Board of the DBPR for licensure as an assessor. Students who attend this course receive documentation evidencing specific training in "mold, moisture and respiratory protection" as well as detailed discussions regarding the Florida Standards of Practice. This course may serve as an exam prep course for the approved State examination, also required for licensure. The New York State Labor Law requires 32 hours of training in mold, moisture, respiratory protection, protocol writing, post-remediation clearance and a proctored examination. This onsite course includes extensive hands-on training including sampling processes, PPE, building containment, establishing negative pressure and fresh air makeup. Once the applicant completes these two requirements onsite, offered by NORMI, application is made directly to the State for licensure. The New York State Labor Law requires 24 hours of training in mold, moisture, respiratory protection, protocol writing, post-remediation clearance and a proctored examination. This onsite course includes extensive hands-on training including sampling processes, PPE, building containment, establishing negative pressure and fresh air makeup. Once the applicant completes these two requirements onsite, offered by NORMI, application is made directly to the State for licensure. The New York State Labor Law requires 16 hours of training in mold, moisture, respiratory protection, hazard communication, workplace safety and a proctored examination. This onsite course includes extensive hands-on training including sampling processes, PPE, building containment, establishing negative pressure and fresh air makeup. Once the applicant completes these two requirements onsite, offered by NORMI, application is made directly to the State for licensure. Many assessors struggles with writing a legible remediation protocol that guides the remediator through either the sanitization or remediation project. This four (4) hours CEU course is a great stand-alone course for those who wish to learn how to write effective and easy to use remediation protocol. In a desktop setting, the student is taught how to create a remediation protocol template using MSWord, the IICRC S-520, NY City Guidelines and the NORMI Professional Practices. This generic Mold Remediation Protocol (MRP) can then be easily modified to fit any project, small or large. Once completed, the student may apply for NORMI certification based on specific criteria and under separate cover. Must has been written about the health concerns connected with mold and other IAQ contaminants. This one (1) hour CEU course details some of the physical reactions associated with mold and highlights the importance of protecting the occupants and workers from mold exposures. The information contained in this class is provided with backup documentation gives a clear understanding of how mold may affect our health. It is the responsibility of the remediation contractors, technicians and mold workers to protect themselves and the occupants from mold contamination in indoor environments. This one (1) hour CEU course emphasizes the importance of avoiding scare tactics while incorporating good solid documented information and practices that will protect the public during and after a mold project. The mold profession training often lacks details and approved standards but utilizes a host of materials to create guidelines for best practices. This three (3) hour takes the student through the standard guidelines and library resource generally used for mold assessment and remediation with specific emphasis on the insurable NORMI Professional Practices as it becomes an integral part of any mold sanitization or remediation process. Having a clear system for practicing remediation gives confident to the contractor and the workers that projects will go smoothly resulting in consistent outcome. This four (4) hour CEU course introduces the "NORMI 30 Steps to Successful Remediation", a checklist to govern all remediation projects whether small or large. 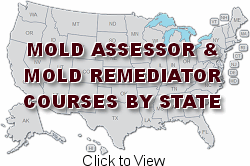 Based on industry standards including the IICRC S-520 and NORMI Professional Practices this is one of the most practical courses on remediation offered to mold assessors, remediation contractors and mold technician/workers on the market today. Many assessors struggle with writing the assessment report because it requires a clear understanding of all the pieces of a big puzzle, how to organize the information and draw conclusions in a clear, concise report. This four (4) hour CEU course is a great stand-alone course for those who wish to learn how to write effective report which interprets, for the client, the information collected during the assessment process. In a desktop setting, the student is taught how to create a Mold Assessment Report (MAR) using MSWord. This generic report template can then be easily modified for future projects saving time and energy in the process. Lacking in the industry has been clear, insurable best practices for the assessment side of the profession. This one (1) hour CEU course takes the student through the NORMI Professional Practices so the he/she will understand how to utilize this resource in bids, proposals and reports to shift liability from his/her shoulders and create a consistent system by which all assessments processed. Lacking in the industry has been clear, insurable best practices for the remediation side of the profession. This one (1) hour CEU course takes the student through the NORMI Professional Practices so the he/she will understand how to utilize this resource in completing successful sanitization and remediation projects using insurable practices. These professional practices complement existing practices whether those practices are based on NY City Guidelines or IICRC S-520. Understanding the mold licensing law as it applies to mold professionals in Florida is critical to protecting yourself from downside litigation. This one (1) hour CEU course takes the student through the Florida Mold Licensing Law Chapter 468. This class is a practical discussion of the implications of the licensing law and how it impacts your business. The Water Damage Prevention Technician course is designed to teach restoration personnel that perform remediation work to give them a better concept of water damage, it's effects and techniques for drying of structures. This course will give residential and commercial maintenance personnel the background to understand the procedures necessary to deal with water losses, sewer backflows, and contamination such as mold. NORMI is introducing this much anticipated and requested course for those who have had CMA/MRSA training and want to gain CEUs and/or work toward a new and advanced assessment certification. This core 14 hour course will fulfill FL CEU requirements for MRSA or MRSR licensees. It is also the core requirement for a brand new NORMI certification. (Additional coursework required). Set yourself apart from your competition! These are classes offered by Best training School and taught by Senior Trainers from Infraspection LLC. The CLAM (certified lead, asbestos and mold worker) is trained in the processes leading to and involved in the remediation of lead, asbestos and mold from indoor environments. This entry level course meets the EPA Lead RRP requirement and trains the worker in the proper techniques related to lead, asbestos and mold assessment and remediation. Many states require specific training in asbestos or mold and this class may serve as a pre-requisite for licensure but is not designed to meet all training requirements in those specific fields. Spanish Certified Mold Worker--El CMW (trabajador molde certificado) está entrenado en los procesos que conducen hacia y participa en la remediación de moho de interiores. Los que trabajan en la industria del molde debe entender la micología básica de molde, los siete componentes de la calidad del aire interior, control de humedad, las técnicas de desinfección, las directrices de remediación, "prácticas generalmente aceptadas", incluyendo los equipos de protección individual (EPI), la comunicación peligros (HazCom) OSHA, y las prácticas de trabajo seguras. Spanish NY Abatement Worker--La Ley del Trabajo del Estado de Nueva York requiere 16 horas de formación de moho, humedad, protección respiratoria, comunicación de riesgos, seguridad en el trabajo y un examen supervisado. Este curso presencial incluye extensas capacitación práctica, incluyendo los procesos de toma de muestras, PPE, edificio de contención, el establecimiento de presión negativa y reposición de aire.Una vez que el solicitante complete estos dos requisitos en el sitio, que ofrece NORMI, la aplicación se hace directamente al Estado para obtener la licencia. Training in the assessment, developing protocol and providing a Certificate of Sanitization for CDW (Contaminated Drywall) for the purpose of leading the client to a NORMI Healthier Home Warranty. Training in the mitigation/remediation of CDW (Contaminated Drywall) utilizing the NORMI CDW Mitigation/Remediation protocols. Evaluates indoor environments for the purpose of developing a profile of issues that affect indoor air quality and drinking water. The Certified Environmental Educator is familiar with the technologies available for solving such problems and trained to offer a limited scope of solutions. The Highest level of training in all areas of indoor air quality and water, including the latest techniques for addressing both. The Certified Indoor Environmental Advisor is able to develop an entire Indoor Environmental Impact Evaluation and offer extensive solutions affecting indoor air quality and water. This course is designed to support the NORMI Healthier Home Warranty program by training the attendee on how to facilitate and service the warranty. With electrical costs skyrocketing and overall power quality diminishing, there has never been a better time for the EcoTrust line of products. By protecting costly electrical equipment, reducing disruptive noise and harmonics, and improving electrical efficiency which will lower electrical utility costs, EcoTrust Energy products provide unsurpassed value in the marketplace. Best Training School offers classes on a variety of subjects including indoor air quality, drinking water quality, "Mold-Free Construction" building practices, and technical training on specific products. Although these classes do not qualify for NORMI Certification status, they are recognized as meeting the same strict criteria of professionalism and commitment to accuracy. The EPA Lead Renovation, Remodeling, and Painting training program has been developed to support the EPA Regulation 40 CFR 745.80 that requires individuals and firms performing renovation, repair, and painting projects that disturb lead-based paint in pre-1978 homes, child care facilities and schools be certified by EPA and that they use certified renovators who are trained by EPA-approved training providers to follow lead-safe work practices. These two courses support the Assessment and Remediation training for contaminated drywall and lead to a certification for each identified as CCDWR and CCDWA. This training program is a comprehensive look at drinking water, our source, the reason why drinking water in contaminated and the systems used to decontaminate drinking water in an effort to improve its quality. This program is designed to be a basic class on the problems and municipal solutions to drinking water problems but introduces the holistic concept of purifying water to make it free from all contaminants. Municipal drinking water, though certainly some of the best in the world, can still be finished by further purification and this class introduces the concept of reaching the very best quality water available and the technologies needed to accomplish that. This is a pre-requisite class to the PSP-Water program which discusses specific technologies available to finish drinking water. Improving power consumption through assessing deficiencies, defining power usage and providing solutions. Improving indoor air quality through assessing homes, defining problems, and providing solutions. If you sell energy consumption products and services you need to be trained on assessing power usage. This program is designed to train Energy Professionals in a solution-based assessment process that includes surveying the customer for perceived energy consumption problems, evaluating the usage and quantifying the problems, offering solutions that are wholistic and represent the latest techniques and services for energy auditing. Infraspection Institute is the oldest independent infrared training and infrared certification firm in the world. Founded in 1980, Infraspection Institute has trained and certified nearly 10,000 thermographers worldwide. With over 35 years in business, Infraspection Institute literally pioneered the infrared training industry.